This conundrum provides the work with its almost schizophrenic nature, with the action split between the two states. The writer has a woman on each side of the wall, but he’s constantly on the move, wanting what he hasn’t got, wanting to be anywhere other than where he is. Trapped in this state of inertia and uncertainty, he’s unable to move on with his life, without the strength to decide which way he should jump. More importantly, with this existential crisis bubbling beneath the surface, even his writing is suffering. Genug Figuren, es wäre eine Überzahl von Figuren selbst für einen dicken Roman. Und es müßte damit sogar die Kritik zufriedengestellt werden können, die Literaturkritik, die sich seit der seligen Postkutschenzeit immer wieder mit der Anzahl der Handlungsträger in Erzählwerken beschäftigt. Enough people, there would be a surplus of people even for a big, thick novel. And it should suffice to enable even the critics to be satisfied, those literary critics who have busied themselves since the golden age of mail carriages with the number of characters in works of fiction. The irony of his comments lies in the way the novel develops. It’s certainly by no means a thin book, but it’s one that features very few characters, and only one starring role. His discovery that in the capitalist world literature has long been repackaged and sold as a consumer commodity comes as a devastating, disillusioning blow. His problems with women are relatively trivial, though, when compared to those caused by his drinking. Very early in the novel, he’s semi-forcibly checked into a rehab clinic, allowing the reader to accompany him through long nights watching the delirium tremens and night terrors of his fellow inmates (and even longer days spent shuffling around the corridors in endless loops). Much of the rest of the novel is spent showing us how he got there, with the hapless writer on a continuous bender, staggering from pub to pub before briefly returning to his latest squalid flat (full of bottles). Yet this addiction to alcohol is connected to his other issues, particularly his inability to write, as he believes that getting drunk is the only way to break through his writer’s block. The sad truth is that he can’t write with it, and he can’t write without it. Several of Hilbig’s books have made it into English courtesy of Two Lines Press (including the one I read earlier this year, Der Schlaf der Gerechten (The Sleep of the Righteous), translated by Isabel Fargo Cole), but as far as I’m aware, there’s no English translation of this one as yet. 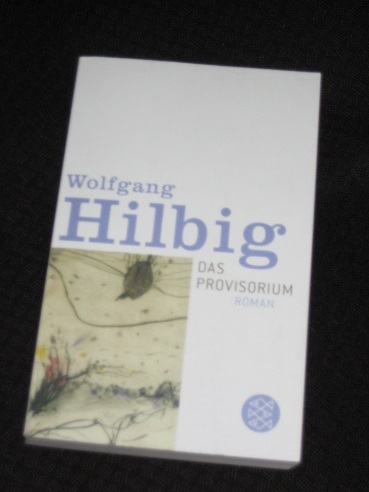 The English title, then, is my suggestion, a near translation of the original idea, and with the words ‘Provisorium’ and ‘provisorisch’ (‘temporary’ or ‘provisional’) peppering the text, there’s much in Hilbig’s novel that is temporary. However, I chose this expression for the double meaning it contains in English; looking back from our twenty-first century vantage point, it’s only natural to see the GDR itself as a temporary state, especially as the end of the novel takes us past the momentous events that ended the eighties.